Right on the river Smelteverket is situated right on the banks of Akerselva river, in the basement of Mathallen in the Vulkan area of Oslo (entrance from the bridge and from inside Mathallen). The premise used to be an old train track production plant and the interior is a testament to this. Today it’s a long, cosy, rustic venue for food & drinks & entertainment. We’re open 6 days a week, and can also be used as a venue for work-shops, press conferences, launches and other private events. 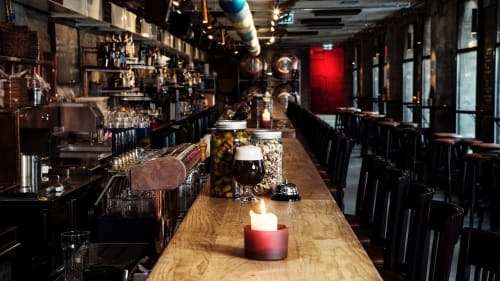 Please see our events section for further details Smelteverket has one of Oslo’s best selections of craft beers on tap, and a wide variety of imported and local bottled beers. In addition to a solid base of known favorites, we always have exciting new beers coming in. Our menu is inspired by our love for food and the places we’ve lived. The menu consist of sharing plates, and will provide a social eating experience. And of course, all our food tastes delicious with beer. We also offer a wide selection of entertainment on a weekly basis, from pub quizzes, to concerts, to stand-up comedy and more. Smelteverket is the perfect place to catch up with old friends, wind down with colleagues and meet new people. -Leie av kun lokalet- Det er mulig å leie kun lokalet. Leieprisen er timesbasert. Ta kontakt for å få et pristilbud.